With John Murphy passing away on the 11th October, 2015 it was inevitable that a tribute album would be released at some point. Thankfully this rather daunting task was taken up by The Epicurean, the label of John’s most recent output as Last Dominion Lost, Krank and The Grimsel Path, who have done a stunning job of bringing this 3xCD/ 32 page booklet together. Also, whilst I initially perceived this to be a straight tribute, the liner notes reveal the concept was already well underway in mid-2015, with an intention for all proceeds from the release to go towards John’s medical treatments at the time. 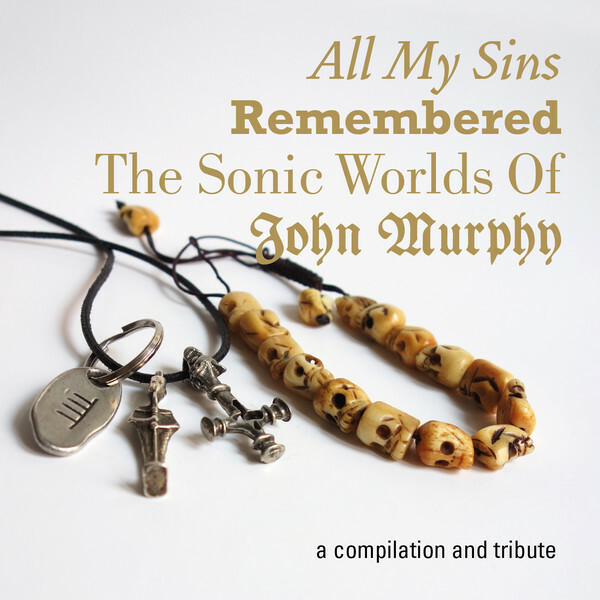 With the musical content spanning 3 discs there is simply too much to give a track my track review, but that also would be missing the point of what this release is about – that being to celebrate the life and musical legacy of John Murphy. On this 3 disc set it provides a broadly chronological overview of the many projects John had collaborated with or been a member of over his 30+ year musical career (…although given the sheer number of projects, some of which whose activities span many years, a strict chronological order is simply not possible). It is then of particular interest that of the 36 artists/ projects featured herein, it still does cover all projects John has been involved in, with there being many other high profile bands and projects he has collaborated with over the years not being featured, which only goes to further highlight the eclectic nature and expansive reach of John’s career. But of those featured herein, in order of appearance across the 3 discs it includes: Mandrix, NEWS, WhirlyWirld, Associates, Hugo Klang, Krang, Orchestra of Skin and Bone, SLUB, Dumb and the Ugly, Whitehouse, Lustmord, Sooterkin Flesh, Genocide Organ, Vhril, Blood & Iron, Wertham, Bordel Militaire, Browning Mummery, MAA, Gerechtigkeits Liga, Krank, The Walking Korpses, The Grimsel Path, My Father of Serpents & Disciples of None, Of The Wand And The Moon, David E. Williams, Shining Vhril, Nikolas Schreck, Kniffeladder, Blood Axis, Naevus, Foresta Di Ferro, Die Weisse Rose, Andrew King, Zeena Schreck and last but not least Last Dominion Lost. Whitehouse: ‘Live Action 4’ from 1983 is a 20 minutes a dueling synth workout of throbbing modulations and spitting static in early chaotic Whitehouse style. Krang: ‘Dissonance 2’ from -1981-1983 highlights John’s own solo industrial noise approach from around the same time as he was collaborating with Whitehouse. Orchestra of Skin And Bone: feature with an excellent song ‘Flame’ from 1996, consisting of screeching horns and rolling tribalised percussion, which draws (an oblique) parallel with John’s later tribal industrial band Knifeladder. Lustmord: ‘Pure’ (a track lifted from 1986’s ‘Paradise Disowned’ album), is a grinding industrial noise soundscape from the period when John was involved, and showcases the early era of the project before it evolved into the more widely recognized dark ambient behemoth it is today. Vhril: Being an early 90’s collaboration project between John and Ulex Xane, ‘Transcosmic Mutations’ delivers an excellent esoteric ritual industrial track of twisting and constantly morphing sonics. Genocide Organ: Although John was never a member of the Genocide Organ, he did provide sound source material on 1999’s ‘The Truth Will Make You Free’ album. On their ‘untitled’ track the group have paid tribute with an instrumental piece which is quite subdued by the group’s usual standards, but given its droning and metallic scraping experimental/ industrial soundscape it clearly is homage to John’s stylistic approach. Knifeladder: Being the trio of John, Hunter Bar and Andrew Trail, they feature with a previously unreleased 2007 track ‘Long March’, which is of their trademark song styled, tribal/ industrial percussive approach. Gerechtigkeits Liga: On 2009’s track ‘Dystopian Dream’ it features a fantastic elephantine percussive stomp (courtesy of John) as the key driving element of this post-industrial dirge. Krank: Being John’s predominantly solo industrial project, the 2011 track ‘Drain Sounds in the Well’ features his distinctive chaotic swirling industrial maelstrom of grinding layered synths, garbled vocalisations and a mélange of found sounds/ random tonal objects. Forest Di Ferro: Being the trio of John, Marco Deplano and Richard Leviathan, they feature with the 2015 track ‘Kalagni – False Dying Dawn’, which is a subdued martial ambient piece of distant rolling drumming, lead accordion melody and lamenting vocals of John. Last Dominion Lost: Being the trio of John, Julian Percy and Jon Evans, they feature with 2015’s ‘Hexatom Recrudesce’. This is an alternate version to a track from 2014’s ‘Towers of Silence’ album, being a twisting garbled mass of bass throb, scattered synths, found sounds, lone woodwind flute and evocation styled vocals. Of The Wand and the Moon: present a new 2016 exclusive track ‘Death Rune’, which is a beautifully haunting funeral dirge of a track with central organ/ accordion melody, ritual chimes and chanted/ whispered vocals (…simply sublime). If nothing else this release demonstrates the sheer diversity of musical involvement and output of John over the years, but though mid to later periods showcasing darker sounds and esoteric themes providing the thread to neatly knit it all together. Regarding package it is stunningly designed, featuring photos of John’s own amulets and jewelry, while the 32 page booklet includes written pieces provided by Stefan Hanser (label head of The Epicurean), Jon Evans, Alan Bamford and Andrew King provides further insight regarding the life and wide reaching musical involvement of John and are broadly framed around significant periods of his musical career (i.e. Australia and first England period (1997-1984), second period in England (1996-2008) and the final period in Berlin (2008-2015)). With its limitation of 750 copies, and exquisite packaging and graphic presentation apart from being a window into John’s expansive sonic world, it has more real world implications given that all proceeds from sale are to be donated to John’s widow. A worthy document, testament and above all a celebration of the life and legacy of John Murphy. This entry was posted in 2016, death industrial, experimental, industrial, martial industrial, neo-folk, noise, other, post punk, power electronics, ritual, The Epicuriean by noisereceptor. Bookmark the permalink.